138 Marion, Iowa, June 9, 1924. 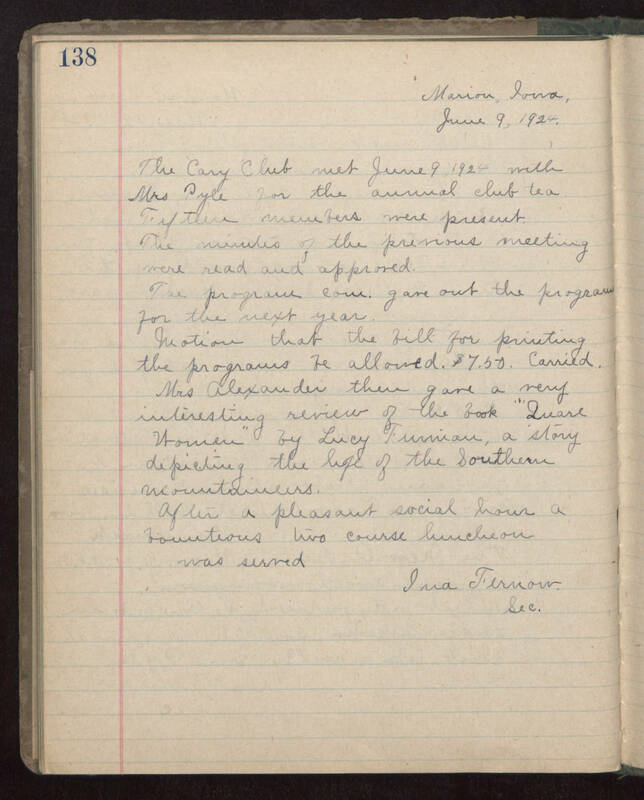 The Cary Club met June 9 1924 with Mrs Pyle for the annual club tea Fifteen members were present The minutes of the previous meeting were read and approved. The program com. gave out the program for the next year. Motion that the bill for printing the programs be allowed. $7.50. carried. Mrs Alexander then gave a very interesting review of the book "Luare Women" by Lucy Furmian, a story depicting the life of the Southern mountaineers. After a pleasant social hour a bountious two course luncheon was served Lina Fernow. Sec.